What a day. Right? Ten Stakes races in a row. Nine of them Graded Stakes. Six of them Grade 1 events. Now, that my friends, is a race card. Let’s take a look at what we have come up with on this spectacular racing and betting day. 2nd: 2-8-6-7-4…Easy Goer Stakes…Post time for the first Stakes event comes at 12:11 p.m. ET, and it kicks start a heckuva day of racing. My first “dot” and Best Bet of the Day comes right here, too, with Mask (2). This one won his first two career starts for trainer Chad Brown and Lane’s End Racing. After his impressive victory in the Mucho Macho Man Stakes at Gulfstream Park on Jan. 6, many touts in the business were ready to claim this one to be the next KY Derby winner. After all, he is by Tapit and out of a Stakes winning mare who has a winner and SW from three starters. But he came out of that win with a hitch in his giddy-up and it took awhile to get back to the races. When he did — in the G3 Pat Day Mile at Churchill Downs on the KY Derby undercard — he caught a soup bowl of a racetrack and lost much of his conditioning. Now, he looks to be back and he had a super work at Belmont on June 3. He is 5-2 ML odds and gets HOF rider Javier Castellano back in the irons. Let’s kick start this day with a good one right here. I bet the 2 to win/place and then key the 2 over/under the rest of the numbers listed above. 3rd: 6-1-4-2-7…G1 Ogden Phipps Stakes…Abel Tasman (6) was my pick of 2017. I loved her going into the KY Oaks, and she rewarded me with a huge win, and huge payoff. She had a spectacular year last season, with 3 wins and 4 seconds in 7 starts. She did not fare as well at Churchill Downs on Oaks Day this year, though, when she started the 2018 campaign in a Grade 1 event. She was bet down to odds-on favoritism, but never really made a serious run after being bothered at the start and steadied in the first turn. She has since come back to work very well at her home base at Santa Anita. So good, in fact, that trainer Bob Baffert had to summon her to return East for this one. I love her for this start, again. 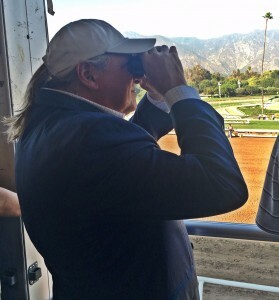 Baffert wins at a .33% clip when he ships in, and at .28% rate in Graded Stakes company. She has raced one time at Belmont Park. She won the G1 Acorn last year on Belmont Stakes Day. I think she returns to her glory days today. I bet the 6 to win/place/show and then key the 6 over/under all the other numbers listed. 4th: 3-5-1-2-7…G1 Acorn Stakes…Monomoy Girl (1) was supposed to be vulnerable in the KY Oaks, after drawing the extreme outside post position in a field of 14 talented fillies. In short and in the end, she was not. She was stunning — per usual. The only question I have on this special day is what kind of race it might be if some way, some how, somebody got Monomoy Girl and Justify to run against each other. Now that, my friends, would be a horse race to watch. Probably could and would never happen. So let’s enjoy them together in separate races today. This gal has raced 7 times in her career. She has won 6 and finished second by a neck in the only other one — when she hit the gate at the start and shied at the 1/8th pole. Still, she lost by a neck. The world of New York will likely bet down 2017 Champ Caledonia Road (5) — since she is 3-for-4 lifetime; since she won the Breeders’ Cup Juvenile Fillies in style; and since she is home based in the City So Nice, They Named It Twice. But my money is on is on Monomoy Girl (1). If I can get even more or better, it is load up the station wagon time and head to Yellowstone National Park. I love this filly. I bet her to win/place and then key her on top over the 5-1-2-7. 5th: 2-9-8-3-4-5-7…G2 Brooklyn Invitational Stakes…This 11/2-mile endurance test could be a grind all the way to the wire for a talented group of older colts and geldings. But my money goes to and one one of the most experienced and talented older runners in the country in the 7YO Hoppertunity (2). He is a perfect 1-for-1 at this distance, when he captured the G3 Tokyo City at Santa Anita on April 8 to begin his 2018 season. He is also 1-for-1 at this track, having won the G1 Jockey Club Gold Cup here in October of 2016. He has been training very well for this after a troubled fourth in the G2 Alysheba Stakes at Churchill Downs on Oaks Day. I toss that one, and look for redemption today. The only horse in this field that I think has the game to beat him is War Story (9), who is likely to be the PT favorite and maybe even odds-on in this NY crowd. He was destroyed by the great Gun Runner to begin the 2018 campaign, but has since returned to win at Tampa Bay and run a tough-beat second in the Charles Town Classic. Nice work on June 2 at Monmouth Park. But I don’t think he is as good as the top choice. I bet the 2 to win/place/show and then box the top 2 numbers solidly in one exacta. I key the 2-9 over the rest in a smaller version. 6th: 5-1-4-8…G2 Jaipur Invitational Stakes…Disco Partner (5) may have lost the Breeders’ Cup Turf Sprint to Stormy Liberal at Del Mar last November, but the two of them are back in Disco’s home park now. This is his home. This is his track. This is his grass. And, it is where he has 7 wins and 2 seconds in 11 starts. The last four times Disco has raced over this grass course, he has won. In fact, he won this very race a year ago. He got in a race at Keeneland on April 7 to start the new year. He ran third that day on a soft surface, and was steadied hard at the 5/16th marker. Finally, he had to split horses to get through. If he gets a better trip for his closing run today, he will be might tough to beat. I bet the 5 to win/place and then key the 5 over/under the other numbers in the exacta. 7th: 9-10-12-8-3-11-7-1…G2 Woody Stephens Stakes…What a race this has turned out to be — on paper, at least. Wow. May be as exciting, well-balanced, and talented a field as any race on the card today — and, obviously, there are some good ones. I go to Promises Fulfilled (9), who is an amazing 12-1 in the ML odds. This guy didn’t care for the speed duel that ensued in the 11/8-mile, G1 Florida Derby — falling all the way from front end burner to last. He didn’t care of the 11/4-mile, G1 Kentucky Derby or the grand Justify, either. After setting the early fractions in that one, he quickly became a memory. But this one turns back to 7-furlongs today and comes in off a head-turning and eye-popping work at Churchill Downs on June 3. Just three starts back, he blistered to a win in the G2 Fountain of Youth. This guy has a world of speed and talent. Maybe he is at a distance today that he can show it — again. The Tabulator (10) is 20-1 ML odds. Amazing. He has raced 5 times in his career and won 4 of them — including an impressive win in the G3 Iroquois Stakes over some good ones last September at Churchill Downs. This guy has world class speed. Strike Power (12) ran second to Promises Fulfilled in the FOY after winning the Swale Stakes at 7 furlongs. Likes this distance. Kanthaka (8) returns to the same 7-furlong distance that he won at in the G3 Laz Barrera Stakes last time out at Santa Anita. He has raced at this distance three times in his 6 race career. He has never been beaten while running this far. All of these deserve some respect and consideration. I bet the 9 to win/place/show and then key the 9 over/under all the other numbers listed. I emphasize the 9 with the 10-12-8-3 the most, though. 8th: 7-5-1-4-3…G1 Just A Game Stakes…A Raving Beauty (7) doesn’t come into this spot with all the credentials and credits that some of the other highly-touted fillies and mares. But she doesn’t really have to, at all. She comes into this one off a run-away victory in the G3 Beaugay Stakes over this very same grass course on May 12 while making her 2018 & North American debut. And, she is trained by one of the game’s best turf trainers — Chad Brown. That was over a “good course.” Today, she is likely to get a more firm footing. Will she be able to hold her form, and move up in conditioning? Time will tell, but if her first test her was any indication, she may be a rising start. Very soon. Proctor’s Ledge (5) has never been over this course before, but she comes into this one off a huge win in the Distaff Turf Mile at Churchill Downs on Derby Day. She caught a “good course,” then, too, but closed with authority to beat a top notched field. She is a stalker and retains one of the best pilots in the game for this one. On Leave (1) has 4 wins in 5 starts over this grass course, and comes into this one off a tough beat second to Proctor’s Ledge at Churchill Downs in the last. She made an earlier appearance on the lead that day than normal, and now Jose Ortiz opts to ride elsewhere. This one has all the credentials in the world, but I don’t like the thought of her regular rider opting to go elsewhere. Ortiz, instead, lands on Lull (4). This one has a win and a second in two career starts here. Another prime contender for this one after starting the year with a win in the G3 Honey Fox at Gulfstream Park back in March. Showed speed that day, but normally rates a bit off the pace. Tough field. I bet the 7-4 (Take Note) across the board and then box the 7-1-4 in the exacta. I key the 7-4 over/under the other numbers in two smaller versions. 9th: 4-5-10-11-6-2-3-9-1…G1 Metropolitan Mile Handicap…My #1 Bet of the Day comes right here with McCraken (4). This 4YO son of Ghostzapper is poised to have a breakout year, in my view, and he tuned up for this one by winning a high-end optional claimer at Churchill Downs on KY Derby Day. He fell well off the pace in the early going and farther back than most would have suspected. He came with a flurry, though, catapulting from last to first with a powerful run. In two tries at a mile, he has won both times. After last year was completed, trainer Ian Wilkes said that he may point this guy to the best 1-mile races in the country. He lands in that group today. It will take a great run to win this one. But this guy is up to it. How do you pass up the 12-1 ML odds? I love it. Let’s ring that bell. Good Samaritan (5) cuts back to a 1-mile run today after finishing third in the G2 Alysheba Stakes at Churchill Downs on KY Oaks Day. He may like this distance better, and he is talented on any surface. Bee Jersey (10) has to step it up today, but he looks very capable of doing just that. In the last three races — all at one mile distances — he has won all three by a total of 191/4 lengths. He has done that by leading every step of the way in all three. He will be airing it out early and often. Awesome Slew (11) is a talent that should not be ignored. He ran third to Battle of Midway, and Sharp Azteca in the Breeders’ Cup Mile in 2017. And, he is training super after his near-miss third in the Churchill Downs. A good price, as well. I bet the 4 to win/place/show and then key the 4 over/under all the numbers. I go heavier with the 5-10-11-6 than the rest, though. 10th: 10-3-8-1-2-13-11-9…G1 Manhattan Stakes…Beach Patrol (10) normally comes back to the races after a layup with a second place finish. He did it in the Hollywood Derby in December of 2016. He did it in the Gulfstream Park Handicap in February 2017. He did it again in the G1 Turf Classic in May 2017. And he did it in the G1 Turf Classic at Churchill Downs again this KY Derby Day. Try as he might and must, he normally returns from a down time with a second. After all, in 18 lifetime starts he has 5 wins and 7 seconds, with 3 thirds. But it doesn’t take him long to crank it up the next time out, either. And, after watching the work here at Belmont on June 3, it looks like this 5YO son of Lemon Drop Kid is ready, willing and able. It’s go time. I bet the 10 to win/place/show and then key the 10 over/under all the other numbers. I go a bit heavier with the 3-8-1-2-13. I also box the 10-3-8 in one lighter version. 11th: 1-7-9-8-5-2-3-4…G1 Belmont Stakes…I will bet the incomparable Justify (1) to win and then key him over the other numbers in the exacta, the trifecta, the superfecta and the Super High Five. Go Justify.